Yesterday, Snack Girl took on July 4th but she forgot to mention her very favorite recipe for the celebration. If you have been following this blog for a while, you know that I am cheap. While I would love to be the person who brings the aged steak to the BBQ, my budget allows me to bring potato salad, watermelon, or baked beans. This recipe makes seven cups of beans and you can bring it in your slow cooker so the beans remain warm. I love these as a side for anything at a BBQ because they go so well with hot dogs, corn, coleslaw – you name it. Beans, of course, are loved by vegetarians and your gluten-free crowd. Because I added sugar (in the form of molasses and it is added to ketchup) this is also a kid pleaser. Don’t tell anyone this, but these beans are high in manganese, magnesium, potassium, selenium, thiamin, and vitamin B6. You get a lot of bang for your calorie buck with beans. There is one ingredient that many of you will not have in your pantry. Liquid smoke can be found next to the barbecue sauces in the grocery store and NO – it is not like adding cigarettes to your beans. Liquid smoke is made by channeling smoke from smoldering wood chips into a vapor. They remove the tars and resins and you get a smoke-flavored liquid that tastes really good and isn’t that different from other types of flavorings (like vanilla which is the essence of vanilla beans). Look for Wright’s Liquid Smoke – it doesn’t have additives such as salt, vinegar, or molasses and retails for $1.99 a bottle. The liquid smoke adds back the flavor that you would have added had you used some pork fat or a ham hock - and it works! I use a ham hock for kidney beans in my book and it is super tasty (but obviously not vegetarian). 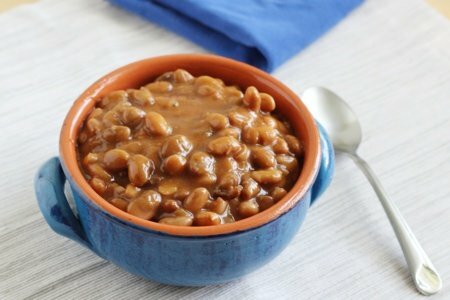 Since posting this recipe, there has been a discussion below about soaking the beans. I did not soak the beans for this recipe and the beans cooked fine. What do you bring to BBQ's? Put onion, chili powder, pinto beans, liquid smoke, and water into a 6 quart slow cooker and cook on high for 3-4 hours or until the beans are tender. Drain the beans and put them back into the slow cooker. Add the ketchup, molasses, mustard, and cider vinegar and mix until blended. Heat on low for 20 minutes or until bubbling. I can vouch for the fact that they are delicious, Saturday and today when I had some lunch. Thanks again for leftovers! Tip soaking beans re: If you soaked something where it does not matter if the beans were, do not link. Cover dried beans with water to a boil, then turn off the heat and let the beans sit for one hour. Then drain, rinse and use as if they were soaked overnight (which, incidentally, is the easiest of all). Ripped is right; you always need to soak dried beans for recipes. Only lentils can be used unsoaked. It is best if you have the time for an 8 hour soak (unheated) but the option to heat them to a boil and let stand an hour before rinsing is one I often find myself using if I haven't planned ahead. It is so nice to come home to the smell of homemade baked beans! These sound great! Perfect for a summer BBQ or picnic and I LOVE any excuse to use my slow cooker! I love beans! They are so nutritious. Thanks for this recipe! Angela is right about soaking. The longer you soak beans and legumes (including lentils) the more phytic acid is removed. Phytic acid binds iron, zinc, magnesium, other vitamins and minerals blocking them from being absorbed by the body possibly causing a deficiency. Soaking until just or nearly sprouted is ideal. That can mean 14 to 18 hours or more. Or, you can soak them for about 3 hours in very warm water (140 degrees). By the way, lentils and rice should be soaked for at least 48 hours to remove a significant amount of phytic acid that is not removed by cooking. Thank you, Snack Girl, for a great recipe; love the liquid smoke info! I'm def going to try liquid smoke in my beans AND in a recipe I'm trying to invent for tofu ''ham steaks''. So far marinating in crushed pineapple, brown sugar, and cloves then sauteing until crispy has been very good but something was missing; I think the liquid smoke is it! Today's post is also so informative on soaking and phytic acid. Here's my 2cents worth: 1) The Brits' comfort food is beans on buttered toast! I tried it and its a good quick nutritious and fiber-rich meal [esp for singles like me]. It's no wonder Boston serves baked beans with their breakfasts too, I tried a fried egg over baked beans instead of hash--delicious! 2) When I do baked beans from scratch, I use my Boston bean pot, pretty close to your recipe except I dice up a big fat carrot too, and add a small whole onion studded with a 7-8 cloves, tuck into the middle of the beans during baking and then remove it when done. [now I'm adding the liquid smoke for a more authentic ham/bacon flavor, can't wait to try this! I'm confused... SnackGirl didn't say she soaked the beans but other people in comments said you have to. If she didn't then I guess they will turn out fine since this is a regular recipe of hers, right? Yeah - what gives with the soaking vs not soaking? Because the beans are cooked for 8 hours they will be edible. I soak my beans and pour off the water because of the phytic acid. Some phytic acid is a good thing but too much and the body won't absorb vital nutrients. Soaking the beans and pouring off the soaking water and replacing it with fresh for cooking helps with the digestion of the beans and reduces gas and bloating caused by oligosaccharide (a type of sugar) as well as removing phytic acid. Read the links I posted if possible and many questions will be answered. "Can I just cook out phytic acid? Phytic acid not cooked out all that effectively. Note in the figure at right that in a 1980 study of phytic acid levels in three cooked beans, kidney beans retained 92% of their phytic acid after cooking, black eyed peas retained 87%, and mung beans retained 64%." Don’t tell anyone, but these beans aren't only sources of minerals and vitamin, but also of all necessary aminoacids which vegetarians and vegans need. I always soak dry beans overnight, its no work at all. I never soaked dry split peas or lentils but I will do so going forward. I did not soak the beans for this recipe and it turned out great (and I tested it multiple times). For larger beans, such as kidney beans - I have found you must soak them. I don't know why it works without soaking - but it does. I love beans. The liquid smoke sounds interesting? Your recipe sounds great, I think I might try it out. Perfect recipe for this summer. Cheers!